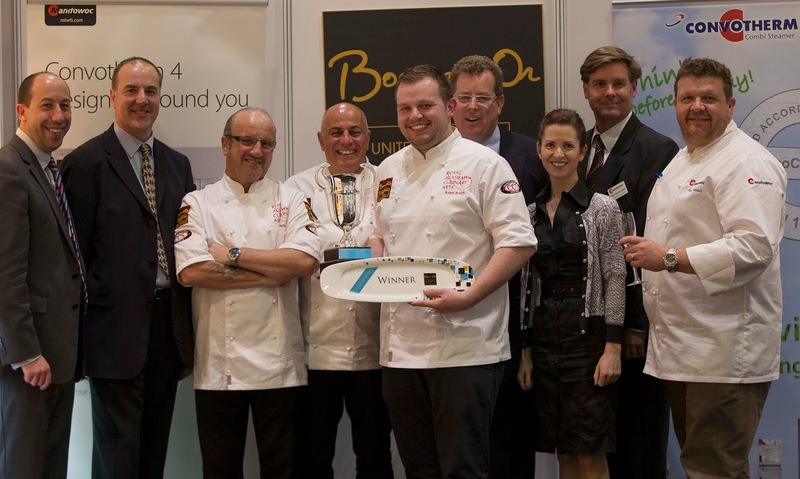 Following a tense 1½ hours cooking, Adam Smith, head chef at The Devonshire Arms in Yorkshire, was awarded first place in the Bocuse d’Or National Selection at Hotelympia on Monday. Steve Love, chef patron at Loves Restaurant in Birmingham was awarded second place. Smith was presented with the Bocuse d’Or UK trophy, donated by University College Birmingham and Villeroy & Boch winner’s plate. Love wins a trip to the Bocuse d’Or Europe in Stockholm next week, provided by Bocuse d’Or sponsor Nestlé Professional. Provided current candidate, Adam Bennett secures a top 12 position on May 8th, both Smith and Love will have the opportunity to work alongside him as he prepares for Lyon in 2015. Armand Sablon, head chef at Ten Restaurant at Cafe Royal and Rajkumar Holuss from The Ritz also competed in what the judges said was a very close final. John Williams, chair of the Bocuse d’Or UK team and 2001 candidate, led the judges which included Andreas Antona, former chef and restaurateur, Nick Vadis, culinary director of Compass Group and UK candidate 2009 and 2013, chef proprietor of The Elephant restaurant and brasserie, Simon Hulstone. The chefs had 1½ hours to prepare, cook and present three different hot garnishes, five portions of each suitable for decorating a Chicken Ballotine. 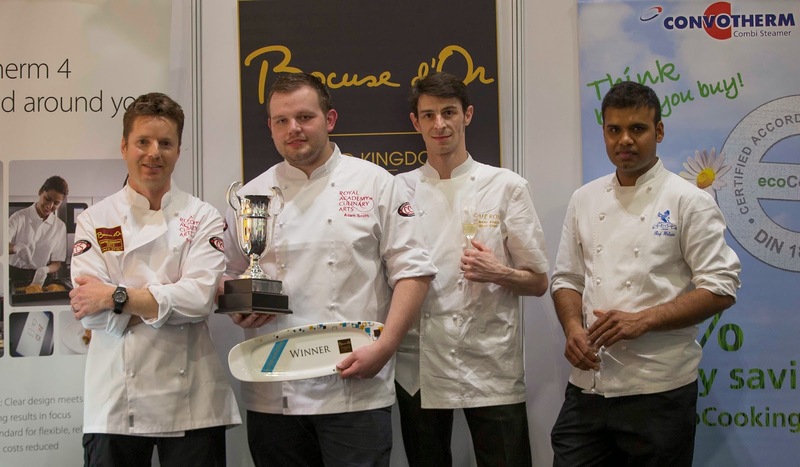 In the style of the Bocuse d’Or, each entry was presented on a silver flat provided by Heritage Silverware, which also supplied the silver for Adam Bennett’s award winning meat platter in 2013.